Removing jQuery from the codebase will make FullCalendar more lightweight and allow for better integration with React/Vue/Angular. We have completed the detangling process! Removing jQuery as a dependency is a non-backwards-compatible change of course, warranting a major version bump to v4.0.0. We will use this as an opportunity to introduce other breaking changes. A spec will soon be released detailing these changes. Subsequently, community feedback will be gathered. Initializing a calendar and calling a calendar’s methods are now done in an object-oriented way. All parts of the API that previously exposed jQuery objects now expose raw DOM nodes or arrays of raw DOM nodes. We now rely on SuperAgent for ajax requests. We will eventually provide a way for you to tree-shake it away if you don’t need it. Drag-and-drop of external elements into a calendar instance can still be done with jQuery UI, but you’ll need to use a connector. We’ve provided this connector, along with a connector for Dragula if you want to use that instead. Please leave a comment if you have feedback! When do you guys estimate a full release of 4.0? This is excellent news! Thank you for your hard work! Why not just support HTML5 drag and drop capabilities? It is super easy and can be transferred across browser windows. So a user could have a list of items on one monitor and the calendar on another monitor. Dragging the items onto the calendar…this can be done firefox to chrome, chrome to chrome, etc with a lot of flexibility. So far Dragula and Jquery UI draggable limits dragging to same window/browser. This is a downer in my opinion when HTML5 drag and drop is super super easy! Thanks for mentioning this Calvin. I’ve been researching this and the major downside seems to be lack of touch support. If another library is required to do this, then we’re sort of back where we started. @calvin_sellers:disqus Would you be so kind to share your implementation of DnD? Very good. I’ve been doing a lot investigation related to schedulers, and ng-FullCalendar was the winner. Removing jQuery is a BIG step in the right direction. I have two questions: Will V4 include recurring events? Any plans for an Angular Material Design theme? Adam replied to me elsewhere that the intent was to do recurring events in V4. When I inquired as to the general approach to the implementation, I understood his response to be that recurrence would be based on rrule.js. There appears that determining how dates are handled (see below) may effect recurrence implementation with respect to time zones, etc. Add recurrence to FulCalendar would make it an easy choice. Do you think V4 will include the full year view? 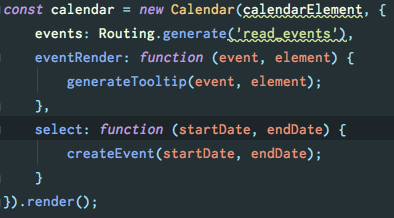 But the fullCalendar method is not available anymore on that element. Hi, I’m very interested in testing/using this new version without jQuery. Unfortunatelly I didn’t get it running in my webpack/vuejs environment. How do I have to import the packages? I tried to add a “import FullCalendar from ‘fullcalendar’;” in the head of my script section of my vue component. But I just get an error (r.a is undefined), if I try to execute my compiled js. Is there a simple example somewhere else, how to do? Hey, just actually had to do this myself in Vue. Works for me at the top of the file. Looks like only the old ES5 way is supported currently. I am planning to use this in my meeting reservation app. Can you provide me an example on how it should be implemented in ReactJS? Your reply would be greatly appreciated! How can I remove an event with the new alpha release? I’m going to give the alpha version a spin however. Is it stable enough to use in production? Or would it be wiser to wait? I enjoyed your post Andrew. Just wait one week. Alpha 2 is almost ready (where many parts of the API have been changed, including removing moment and changing how dates/timezones work). Code complete, but just writing the docs now. The API will be nearly frozen after that point. Yes! Great news. Thanks for the update, and thanks for all of the hard work you’re putting into this. I want to use timezones for my calendar, present i’m using fullcalendar alpha version, can anyone help me please ? Hi! Thank you for FullCalendar. It’s just awesome! I do have a question in Alpha Release 4. In the click of a custom button how do I get access to the calendar. I want to do “fullCalendar.refetchEvents();” on the click of a custom button.